I did one of these about 10 years ago and still on the road today. It was known as the Pete and Marge conversion "not me Pete". The opportunity arose again when I picked a 84 interstate with a rear bad punkin.. 1500 rear ends are abundant due to trikeing.. The conversion utilizes the 1500 rear wheel, Punkin and disk, rear brake caliper, mounting bracket and wheel spacer. For clearance of the wider bracket it must be ground down to fit the left rear shock bolt which also must be ground down. Original 1200 tire is a 15 inch with the 1500 being 16 inch.. With this mod it is recommend using a Avon tire. Tire must be deflated for the tight squeeze to get the wheel into place. I did this conversion for the exact same reason. I picked up a 86 Interstate with torn up splines for cheap, it was sitting for about 7 years because of that. To make a long story shorter, after cleaning it up and changing all the fluids I swapped the final drive and wheel with brake mount and spacers from a 1500. This was a very simple job that took me only a couple of hrs to complete. The only tools I used were the basic hand tools for changing a rear tire and for the modifications a set of vernier calipers to measure the space for the new brake anchor, a bench mounted belt sander to grind the mount and lower shock bolt. Because I like my Darkside tire I have mounted on the 1500's 16" rim I had to trim a little from the width of the rear fender forward of the upper shock mounts. I am now running a 195-55-16 CT on my new to me 1200. The biggest bonus is that this was simple,affordable, parts are easy to find and you have a rear end that has the improved bearing design for longevity. 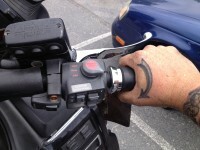 Oh ya and now the 1200 can go Darkside..,..
RoadRogue wrote: I did this conversion for the exact same reason. I picked up a 86 Interstate with torn up splines for cheap, it was sitting for about 7 years because of that. To make a long story shorter, after cleaning it up and changing all the fluids I swapped the final drive and wheel with brake mount and spacers from a 1500. I've long accumulated parts to do this at next tire change .... have some other mods like SS brake hoses for same time .... maybe this season? Looks great ..... love the redline! Let me ask you though .... did you note a change in rear brake application, like "how do it feel" in relation to rear brake power with smaller 1200 rotor? I've long accumulated parts to do this at next tire change .... have some other mods like SS brake hoses for same time .... maybe this season? 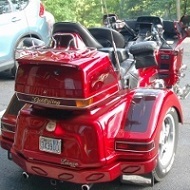 Me too, I found a guy with the parts left over from his Dad's trike conversion. Got all parts needed + a rear caliper for 50 bucks! 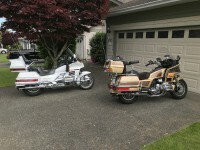 The guy wanted me to take the 1500 saddlebags also but what would I do with them? I'll do this project when I need a new rear tire. I think there is an issue with which spacer to use with which axle. There are some differences there also. There is another good thread on this board somewhere, about the swap. I have read that rear braking is improved due to increased OD of rotor. Makes sense to me but have not tried it so ??? Mod may throw off the front to rear balance of the system as designed. Probably a try it n see thing. I used the axle,wheel spacers caliper mount from the 1500, the caliper from the 1200 just bolts on to the 1500 mount no problem so there should be no issues with the proportional braking just a larger disc giving more swept area. As a matter of fact I could easily put this diff and wheel back on my 1500 and all I would have to replace would be the caliper mount. With the availability of 1500 rear end parts due to trike conversions this is the way to go if your 1200 has torn up its splines. what year 1500 final drive unit did you use? i'd like to keep this in mind if i ever decide to do the same to my 86 1200. RoadRogue - did you modify the rim in order to fit the CT. Other forums mention moding the rim to have easier install of the CT. Have a CT on my 1800 and want to do the same to my 1200. I would not expect issues, just thought you maybe felt a bit more rear bias with the larger diameter 1500 rotor acting like a longer lever to whoa it down. Mine ain't tore up yet but I long ago planned to do this change and was given parts from trike conversion when I first read about it, liked the better bearing and larger brake both and I'll likely run a 150/80-16 Avon ... actually have a couple I guess. I agree .... great idea. I was planning to paint the 1500 rear wheel's spokes black and leave the rim polished .... but the all black looks good! I can't compare how it feels from the 1200 rear wheel and disc to the 1500 wheel and disc because the splines were too torn up for me to ride the bike when I got it.. now that I have ridden the bike for a few thousand I have to say the braking feels like it is supposed to..... if that makes any sense. roadwanderer2 wrote: what year 1500 final drive unit did you use? i'd like to keep this in mind if i ever decide to do the same to my 86 1200. Hey Stewart, I used the final drive from my 97 while I'm rebuilding the rest of the bike, any 1500 drive should work for for this conversion. Rednaxs60 wrote: RoadRogue - did you modify the rim in order to fit the CT. Other forums mention moding the rim to have easier install of the CT. Have a CT on my 1800 and want to do the same to my 1200. I tried to mount a 15 CT to the stock 1200 rear wheel once, it would not seat the bead even at dangerous pressures so I abandoned the Idea of Darkside my a 1200 until I found this conversion to the 1500 final drive with its 16" wheel. I knew that the CT would seat the bead at less than 40psi as I had done it twice before. First with the Austone tire and then with this Altimax tire, both very good Darkside tires in my opinion. There was NO need to modify the stock 1500 rim. As for any differences in the bead seat area between car tires and bike tires both tires are made of rubber and will flex and mold to any discrepancies in the shape of the rim when aired up. thank you RoadRouge for your descriptions on this, but one thing i didn't see mentioned, which drive shaft did you use, the one from the 1500 FD, or your original 1200 drive shaft. tell me something, what if any riding characteristics have changed, ride comfort IE: smoothness, height, handling, cornering, etc. do you feel "comfortable" with the modification to your bike? i've read a lot of different theories on going to a ct on these wings, do you trust it? hey, im all for any tire on a bike that will last more than 9,000 miles, but a ct on a bike? my wife's car has the same tires on it as you have on your bike, and i like the general altimax tires, they are a good tire at a good price and they last a long time. in the 10 years that we've had them on the car, they never had one single flat just merely wore out over time. they've lasted approx 25,000 miles each. it would be nice if they lasted that long on my bike. petevenne wrote: I did one of these about 10 years ago and still on the road today. It was known as the Pete and Marge conversion "not me Pete". The opportunity arose again when I picked a 84 interstate with a rear bad punkin.. 1500 rear ends are abundant due to trikeing.. The conversion utilizes the 1500 rear wheel, Punkin and disk, rear brake caliper, mounting bracket and wheel spacer. For clearance of the wider bracket it must be ground down to fit the left rear shock bolt which also must be ground down. Original 1200 tire is a 15 inch with the 1500 being 16 inch.. With this mod it is recommend using a Avon tire. Tire must be deflated for the tight squeeze to get the wheel into place. quick question......what size Avon venom tire did you use? and since the "venom" tire is VERY hard to find, do you recommend any other Avon tire like the Avon "cobra"? RoadRogue - Thaks for your input, heard that it was difficult to seat a CT on the 15" rim. Have to replace the tires for next years riding season and will see how long a new set lasts. Like the Avon Cobras as well. Stuart - a CT on a bike will behave the same as an MC. Find a CT with a more rounded profile instead of a squarish one. These are not sports bikes and because of this a CT handles very nicely, although some of the converts have mentioned that scraping pegs on a GW with a CT is no different than with an MC tire. It is quiet, smooth, handles well - dry and wet riding, the side wall does not roll as if it was on a car, and lasts longer. Your front tire will also last longer. hey Ernest, i know most of the car tires have the squarish profiles, but IS there a brand of car tire that has the roundish profile out there as i've never seen one. Don't want to hijack this thread. sent PM. In my notes that I have had for a few years on that same install, it seems he used a use the 150/80-16 "Venom X". The tire is actually slightly narrower than the OEM sized GL1500 rear 160/80-16 Dunlop, but has a load rating of 908 lbs .... at same width as OEM GL1200 rear tire with less chance of rubbing issues. 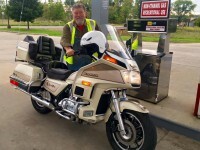 The "Avon Cobra" is for tourers as well as cruizers. Last edited by CrystalPistol on Wed Nov 23, 2016 12:21 pm, edited 1 time in total. Hey CP, thank you for these tire sizes. im gonna write them down and keep them for future reference. roadwanderer2 wrote: thank you RoadRouge for your descriptions on this, but one thing i didn't see mentioned, which drive shaft did you use, the one from the 1500 FD, or your original 1200 drive shaft. tell me something, what if any riding characteristics have changed, ride comfort IE: smoothness, height, handling, cornering, etc. do you feel "comfortable" with the modification to your bike? i've read a lot of different theories on going to a ct on these wings, do you trust it? Stuart I would venture to say that I have absolute faith in the CT that I choose for the back of my bikes. 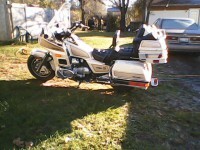 I would say that the handling and traction are actually better than any stock MC tire on the GoldWing. Better traction wet or dry, better straight up or leaned way over grinding foot pegs. I can't make this thing slip under either acceleration or heavy braking wet or dry. I got 30,000 miles out of the Austone tire, that's hard miles playing in the twisties, pulling my heavy tent trailer ,paved roads, gravel roads and every weather you can imagine for my area. I am expecting at least that kind of mileage from this tire as well. hey, im all for any tire on a bike that will last more than 9,000 miles, but a ct on a bike? I say to you that Yes a CT on a Wing works very well, I would even dare to say that my CT will out perform your MT in a head to head ride off. my wife's car has the same tires on it as you have on your bike, and i like the general altimax tires, they are a good tire at a good price and they last a long time. in the 10 years that we've had them on the car, they never had one single flat just merely wore out over time. they've lasted approx 25,000 miles each. it would be nice if they lasted that long on my bike. i will keep all of this in mind for when its time to change out my rear tire along with upgrading to a 1500 final drive. Hey RoadRogue how the hell did you het that 195 tyre into a 1200 swingarm....there is no way that fits mine I have dond thd 1500 rear drive snd whe bug thd 195 tyre contacts both sides of the swing arm tight.....help whats next??? Nik27 wrote: Hey RoadRogue how the hell did you het that 195 tyre into a 1200 swingarm....there is no way that fits mine I have dond thd 1500 rear drive snd whe bug thd 195 tyre contacts both sides of the swing arm tight.....help whats next??? I dont know what to tell you,other than I had to mount the wheel and final drive together and then slide the drive onto the driveshaft and swingarm. There is enough room for the tire on my 86 Interstate.